When selecting a handgun for personal protection I suggest that one of the criteria you should consider is that it is already in wide use by law enforcement and military. There are several types of handguns that may have hundreds of thousands of units issued. This means that millions of rounds have been fired through these weapons. If there is some type of weakness in the design then all of these shooters will find it. I don’t have the time of money to experiment with new and trendy firearms only to find out that they are finicky, undependable, or inaccurate. I let thousands of police and military personnel do my testing and evaluations. If they can’t break their weapons with the abuse they inflict, then if I get the same one, with the love and care that I will provide it will run dependably and last forever. Why not also apply that same philosophy to defensive ammunition selection? Choose ammunition that is already used by countless law enforcement officers and agents all over the United States and the world. Overpressure ammunition, commonly designated as +P or +P+, is small arms ammunition that has been loaded to a higher internal pressure than is standard for ammunition of its caliber, but less than the pressures generated by a proof round. 9mm, .45 ACP, and .38 Special is available with +P power. There isn’t such a thing as +P .40 S&W or .357 Magnum. Only use +P ammunition in firearms that are safe for that kind of ammunition. Refer to the firearm’s operating manual or the manufacturer’s website if you are not sure. Full Metal Jacket (FMJ): Military round specified by Geneva Convention. Metal surrounds lead or steel core to prevent additional mushrooming of bullet, which may cause inhumane wounding. Usually has lead-exposed base. is a small-arms projectile consisting of a soft core (often lead) encased in a shell of harder metal, such as gilding metal, cupronickel, or less commonly a steel alloy. In military nomenclature, it is often labeled ball ammunition. Frangible (Fran): Prevents ricochet by breaking apart on contact. Can be made from empty cartridge cases filled with epoxy and compressed birdshot, metal dust or filings. Developed for air marshals to avoid over-penetration and ricochet aboard airplanes. All energy is transferred to the target, making it a devastating defensive bullet. 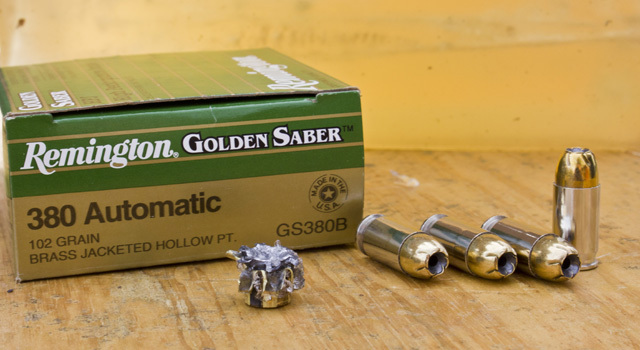 Hollow Base Wadcutter (HBWC): Preferred by some target shooters, this flat lead bullet with hollow base punches neat, round holes in paper targets and makes scoring easier. Creates better gas seal to prevent gas blow-by and increase velocity. Hollow Point (HP): Hollow cavity in bullet’s nose allows expansion on impact. High Velocity (HV): Ammunition with velocity over 1,200 feet per second. 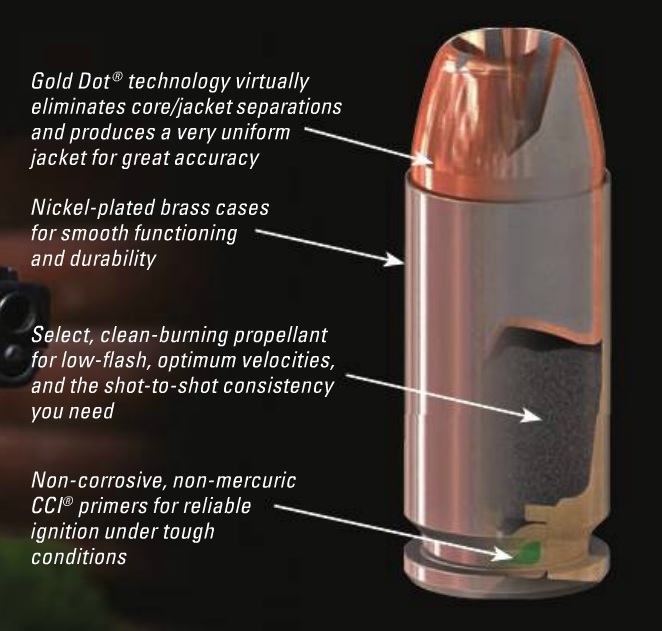 Jacketed Hollow Point (JHP): Jacketed bullet with hole in tip to promote expansion on impact. Jacketed Soft Point (JSP): Jacketed bullet with hole in tip to promote expansion on impact. 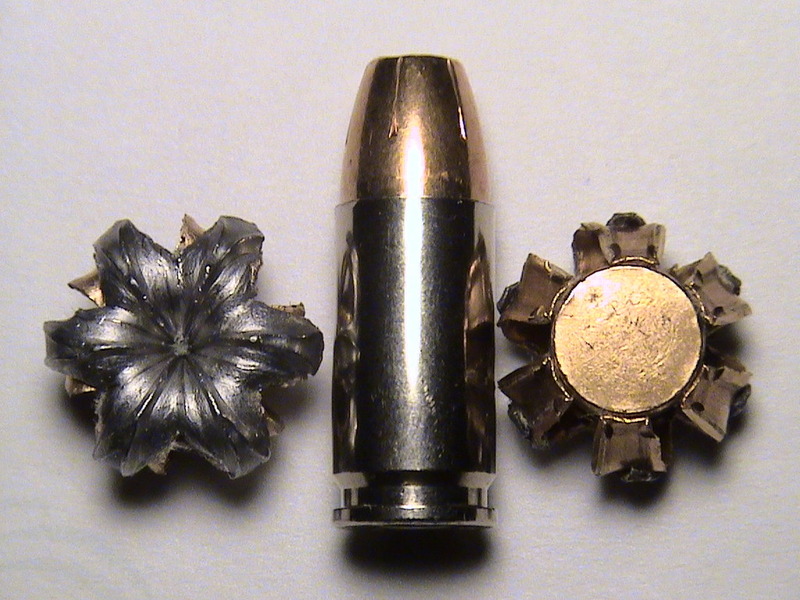 Lead (L): An all-lead bullet. Lead Round Nose (LRN): Solid lead bullet with round nose. Lead Semi-Wadcutter (LSWC): Lubricated solid lead bullet with semi-pointed nose. Swaged to form sharp shoulder to produce clean holes in paper targets. Good choice for target practice or general shooting. Lead Semi-Wadcutter Hollow Point (LSWCHP): Lubricated solid lead bullet with hollow point. Swaged to form sharp shoulder to produce clean holes in paper targets. Good choice for target practice or general shooting. Metal Case (MC): Same as metal-jacketed bullet. Round Nose (RN): Round nose promotes positive, reliable feeding. Semi-Jacketed Hollow Point (SJHP): Exposed lead tip expands more rapidly than jacketed hollow point design. Controlled penetration provides maximum energy transfer, making it suitable for hunting. Semi-Jacketed Soft Point (SJSP:) Exposed lead soft point with reliable expansion and deeper penetration than hollow point bullets. Copper jacket and swaged lead core improve concentrically, balance and accuracy. Soft Point (SP): Exposed lead tip and broader point diameter provides rapid, controlled expansion at somewhat lower velocities. Semi-Wadcutter (SWC/SW): Lubricated solid lead bullet with semi-pointed nose. Formed by swaging process, resulting in a sharp shoulder for clean hole-punching in paper targets. Good choice for target practice or general shooting. I n the book The Gun Digest Book of Combat Handgunnery, author and well known gun guru Massad Ayoob analyzes ballistic and terminal performance of handgun ammunition used in actual police shootings. Based on statistical data from real shootings, he goes on to recommend specific brands and weights (grains) of ammunition. His recommendations are based on the historical ability to actually stop an attack, rather than from observations of a bullet’s effect on ballistic gelatin. Below I have listed the most popular handgun calibers and included a brief history on each. I have also listed out Ayoob’s recommendations for what specific brand and weight has been proven to be effective fight stoppers in actual law enforcement shootings. All ammunition has the ability to kill, but his specific recommendations have proven track records as fight stoppers. +P Rated Pistols: Ayoob’s statistical analysis shows that the Speer Gold Dot 124 grain+P, or Winchester Ranger 127 grain +P+ will be your best man-stoppers. Non +P Rated Pistols: Ayoob recommends 115 grain Federal 9BPLE or 124 grain Federal Hydrashok.) 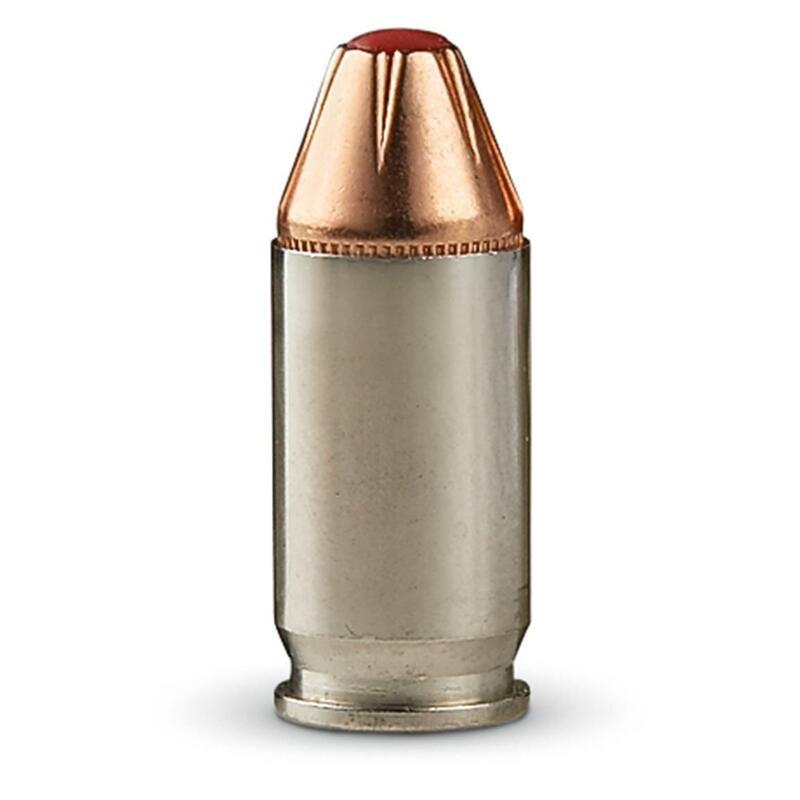 Savannah Arsenal’s Note: Hornady’s Critical Defense ammunition is engineered for use in shorter barrel, non +P rated pistols and has very reliable and predictable expansion when fired through various media (glass, leather, denim, etc.). 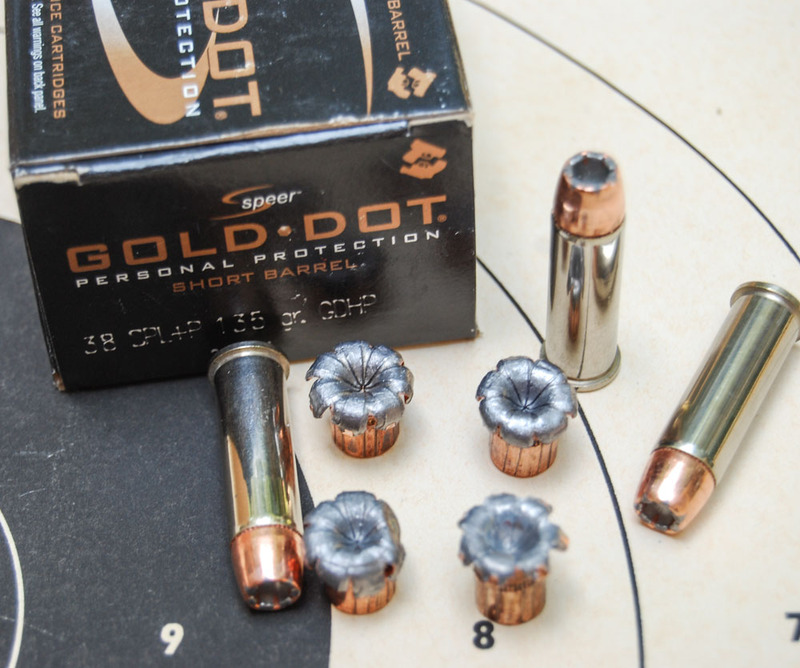 If you can’t find either of those brands/weights combinations, use 115 or 124 grain hollow-points (+P if you gun is rated for it) from one of the major manufacturers. According to Ayoob, all weights of this caliber have performed well. 135 grain bullets travel 1300 fps. 165 grain bullets travel 1150 fps. 180 grain bullets are subsonic and are made for suppressors. Most law enforcement agencies use either 155 or 165 grain loads from various major manufacturers. Ayoob did not state if any particular brand statistically performed better than others, but be sure to stick with the major manufacturers, such as Federal, Hornady, Corbon, Winchester, etc. 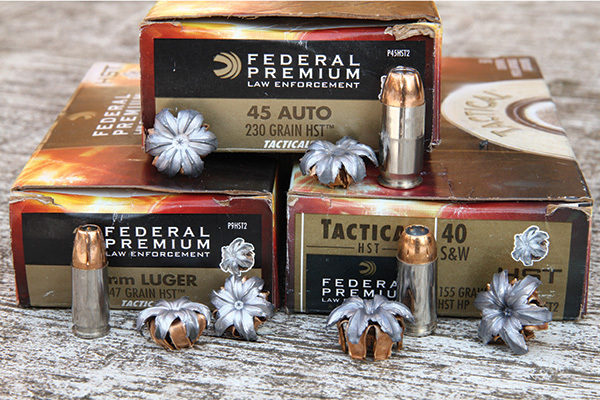 According to Ayoob, the Federal Hydrashok 230 grain hollow-point is the “gold standard” in handgun ammunition. 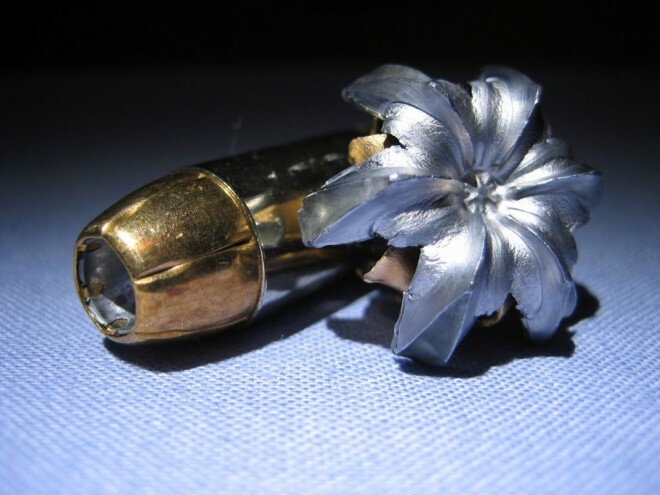 .38 Special snub-nose barrel: According to Ayoob, snubbies like most any 110-135 grain ammunition. 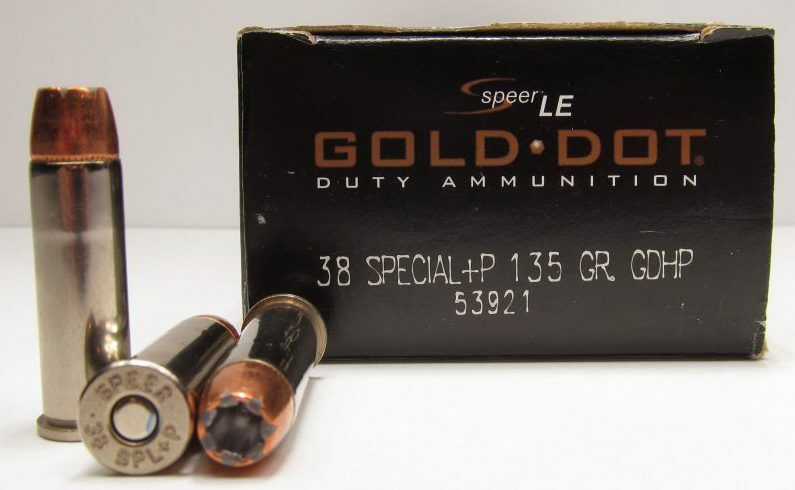 Recommended is Speer Gold Dot 135 grain +P, or Federal Nyclad 125 grain. .38 Special four-inch barrel: Accoriding to Ayoob, the “FBI Load” 158 grain +P semi wad cutter hollow point (+P SWCHP) is statistically the best man-stopper for this barrel length / caliber combination. Snub-nose .357 Magnum: Ayoob recommends using .38 Special, 158 grain +P, semi wad cutter hollow points (+P SWCHP) because full-power .357 Magnum loads are excessively punishing to shoot out of snub-nose revolvers and can only reach their full ballistic potential when fired from a barrel 4″ or more in length. 4″ – 6″ barrel .357 Magnum: Ayoob recommends a 125 grain hollow point. Information of this caliber was not included in Ayoob’s book. According Ayoob, anything less than 9mm is not considered adequate for self-defense (unless physical impairment limits you to using it). This list is generated from Prepared Gun Owners blog on the “approved” list of ammunition appropriate for self-defense use that has been generated by Dr. Gary Roberts (aka DocGKR) from FirearmsTactical.com . He is a subject matter expert (SME) on terminal ballistics and much of the testing of modern ammunition we have online comes from him. The following are the four most popular types of handgun ammunition issued to law-enforcement in the United States. Millions of rounds from these ammunition manufactures have been trusted by our nation’s elite law enforcement, including the FBI, Secret Service, and United States Sky Marshals, LAPD and NYPD. This ammunition isn’t the latest fad, and it has been thoroughly vetted by these agencies. It’s ammunition that you can depend on when it hits the fan. Don’t experiment. Buy what already works. Speer’s hollow point bullet with jacket bonded to lead core to prevent separation and control expansion and penetration. The 165 grain .40 S&W is used by the Federal Flight Deck Officer armed airline pilot program and the US Customs & Border Protection. 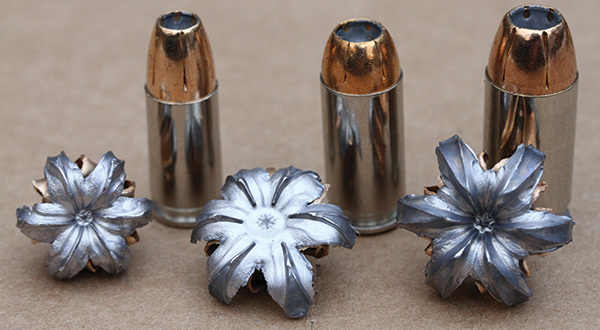 The Las Vegas Metro Police Department uses three different calibers of GDHP. The US Secret Service, US Federal Air Marshals, Texas Department of Public Safety, Virginia State Police, and Richmond PD use 125-gr. .357 SIG. The 124 grain 9mm +P is used by the Chicago PD, and by 35,000 members of the NYPD. In the book The Gun Digest Book of Combat Handgunnery, author and well-known gun guru Massad Ayoob analyzes ballistic and terminal performance of handgun ammunition used in actual police shootings. 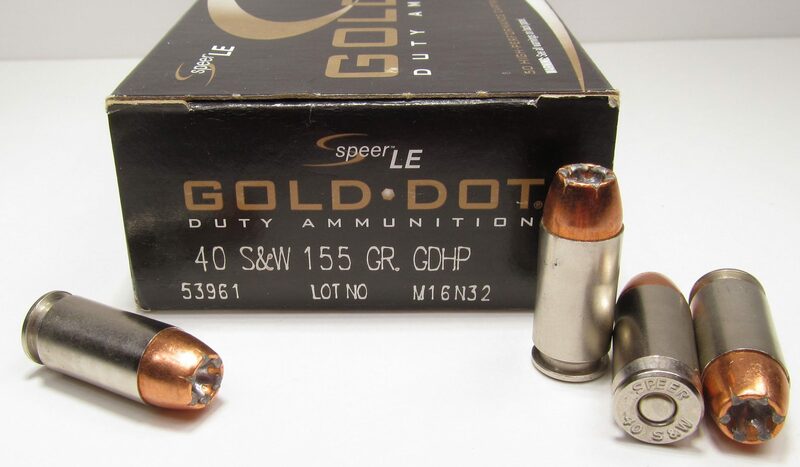 Ayoob’s statistical analysis shows that the Speer Gold Dot 124 grain+P and the Winchester +P+ (now discontinued and succeeded by Winchester’s PDX1 line) is one of the two best man-stoppers in 9mm. 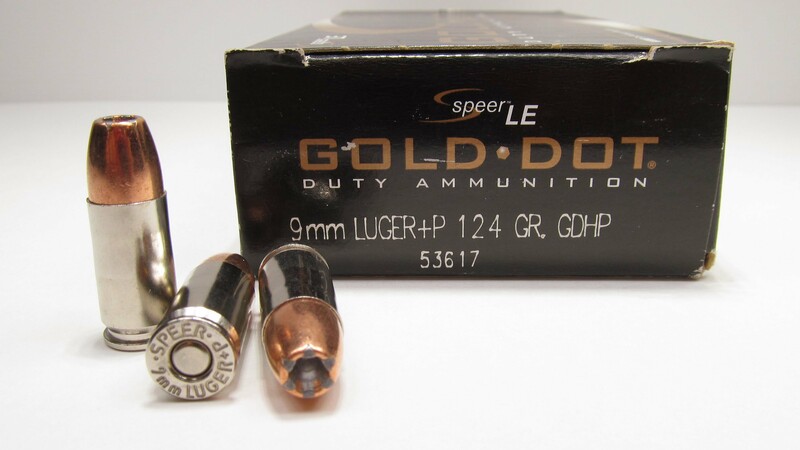 Per request by the FBI, Speer has developed a 135 grain 38 Special +P cartridge in their “Gold Dot” line specifically for snubnose revolvers. The cartridge’s design allows proper expansion at snubnose reduced velocities without sacrificing tactical penetration. The NYPD has authorized this round to be carried by detectives and police officers (backup and off-duty) in their snubnose revolvers. There are also offerings in other calibers specifically made for short barrel pistols (such as the Glock 26/27 or Smith & Wesson M&P Compact). 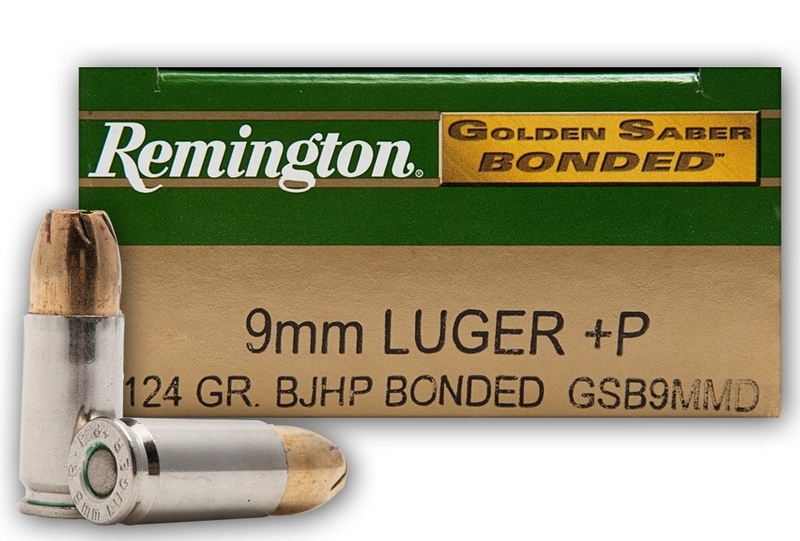 Make sure that you order the ammo specifically made and labeled for short barrels. 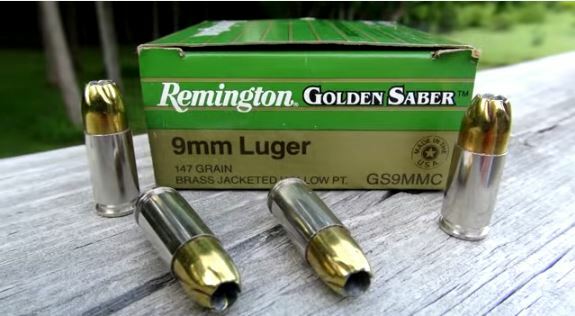 There is a difference between Remington Golden Saber and Golden Saber Bonded ammunition. With the “Bonded” version the bullet’s jacket is bonded to the bullet on a molecular level which helps keep the bullet from deforming past its intended expansion, and from disintegrating during barrier penetration. The Bonded version is going to be your best option if barrier penetration is important to you. If the packaging isn’t labeled “Bonded”, then it isn’t bonded. The Remington Golden Saber “Bonded” 9mm +P was used by the US Customs and Border Protection until they pointlessly moved from 9mm to .40 S&W. The 230 grain .45 ACP is used by the FBI’s Hostage Rescue Team. The 165 grain .40 S&W is used by the Tulsa, Oklahoma Police Department. 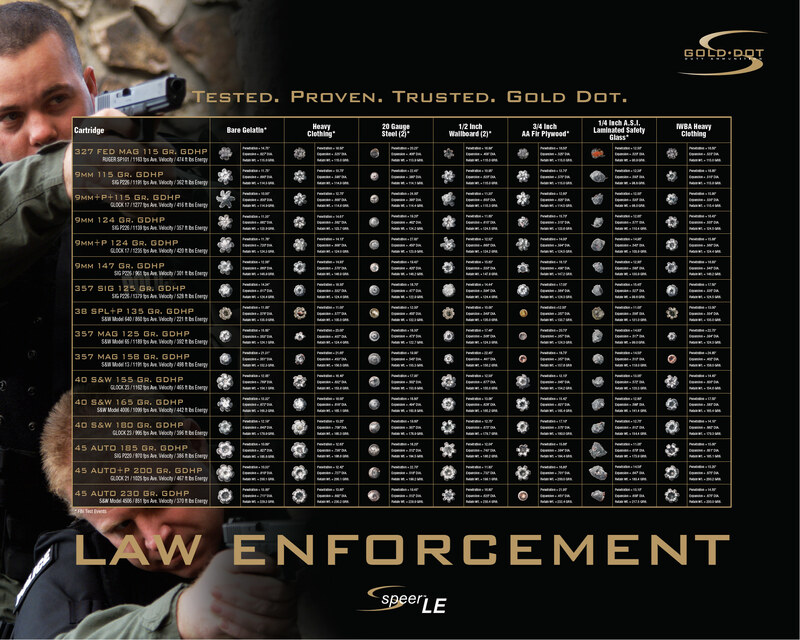 When buying Remington’s Golden Saber ammunition keep in mind that law enforcement almost always uses the bonded +P variation in their full-size and mid-size duty pistols. (except for .40 S&W as there is no such thing as .40 S&W +P). Before buying +P ammunition make sure that your pistol is designed to shoot +P ammunition. If you have a Glock or Smith & Wesson M&P pistol then you are good to go with +P ammo. If you have a pistol whose operating manual states that you should not use +P ammunition (such as a Smith & Wesson Shield), or a smaller frame handgun that might be too punishing to shoot with +P ammunition, you should choose the standard velocity version. Both standard velocity and +P velocity Golden Saber ammunition is available to order at Ammunition To Go. This ammunition is available in standard velocity with packaging labeled “Personal Defense”, and +P velocities with packaging labeled “Tactical”. The “Tactical” +P ammunition exceeds the FBI’s barrier penetration requirement. 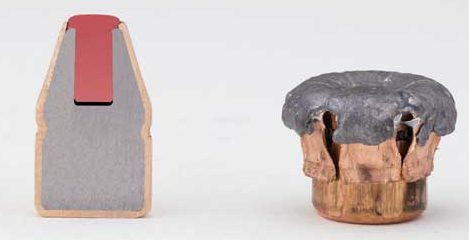 While the other types of ammunition discussed in this section are chemically bonded (meaning that the copper jacket is chemically fused to the lead slug to prevent jacket separation on impact), with HST the jacket is mechanically fused to the bullet. While normally this is a less effective method of bonding, the HST jackets remain attached to their slugs just as well as any chemically bonded bullet. The letters are not an acronym for anything specific, although the internet is full of suggestions (example: “Hydra Skok Two”). Used by the Portland, Oregon, and San Diego, California police departments. With 9mm 147 grain +P JHP you still get fantastic expansion even with subsonic velocity (1050 FPS). This is a good round for suppressed 9mm handguns. Federal’s website will not show their +P “Tactical” loadings on their website. You can view +P loadings on the chart that is included in the photo collage above (click to enlarge). You can find both standard pressure and +P HST ammunition for sale at Ammunition To Go. 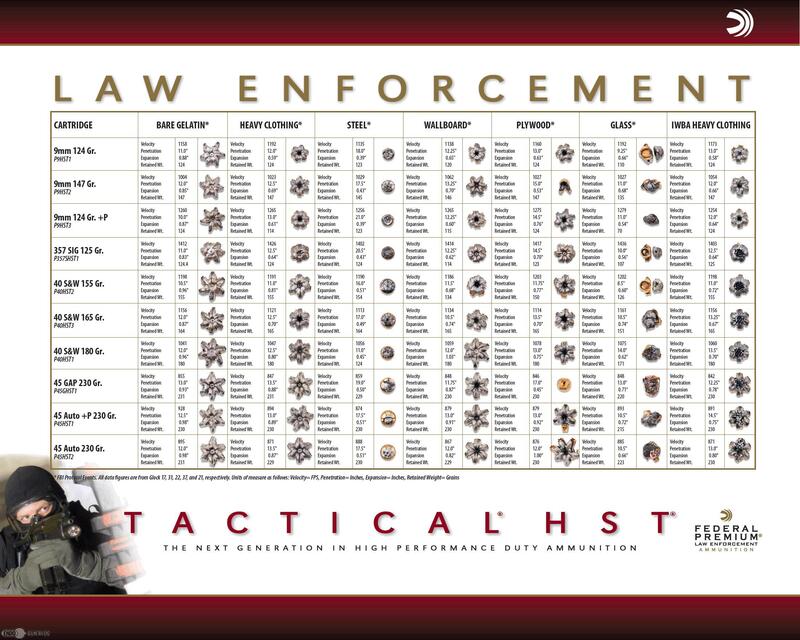 When buying Federal HST ammunition keep in mind that law enforcement almost always uses the law enforcement “Tactical” +P variation of the HST ammunition in their full-size and mid-size duty pistols. (except for .40 S&W as there is no such thing as .40 S&W +P). Before buying +P ammunition make sure that your pistol is designed to shoot +P ammunition. If you have a Glock or Smith & Wesson M&P pistol then you are good to go with +P ammo. If you have a pistol whose operating manual states that you should not use +P ammunition (such as a Smith & Wesson Shield), or a smaller frame handgun that might be too punishing to shoot with +P ammunition, then choose the standard velocity “Personal Defense” version. The Supreme Elite .40 S&W caliber version of Winchester’s PDX1 is currently the primary service cartridge of the Federal Bureau of Investigation. The FBI is currently in the process of switching to 9mm and the ammunition they will use has not been announced yet. The PDX1 can trace its lineage back to the Ranger*, SXT, and the infamous Black Talon lines of ammunition. The PDX1 is bonded while the SXT was not bonded. *Winchester’s law enforcement “Ranger -T” line of ammunition with SXT projectile is still in wide use by many law enforcement agencies. According to Dr. Gary Roberts (aka DocGKR) from FirearmsTactical.com, twenty years ago these rounds were state of the art and several of them dominated law enforcement arsenals of the United States. Some of these are still in production, however their performance through barriers such as clothing has been overshadowed by the technology of the newer law enforcement issued rounds above. 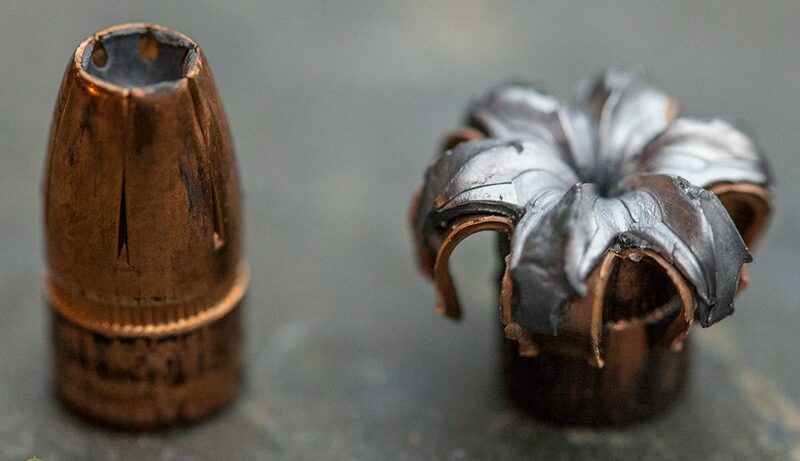 The older bullets have a tendency to plug up and act like FMJ projectiles when shot through heavy clothing. Some of them have significant degradation in terminal performance after passing through intermediate barriers. Modern ammunition which has been designed for robust expansion against clothing and intermediate barriers is significantly superior to the older designs. These were considered top tier ammunition of their day and they successfully help put a lot of bad guys in the ground. While they are not considered to be in today’s state of the art, if you have these in your inventory you should not feel less than confident about your defensive capabilities. As finances allow you might start shooting your older technology ammunition and replacing it with the higher technology ammunition above, or sell it online to someone who isn’t in the know like you are now. **Winchester’s law enforcement “Ranger -T” line of ammunition with SXT projectile is still in wide use by many law enforcement agencies. These lines of ammunition are all current state of the art in terms of expansion performance after passing through thick clothing, however they may lack the barrier defeating and target penetrating capabilities of ammunition that is issued to law enforcement. Also, most ammunition marketed for law enforcement is designed to be fired from full size duty weapons that can safely fire +P ammunition. Many smaller self-defense pistols are not designed for +P ammunition. All of the ammunition discussed below (with the exception of Hornady’s Critical Duty) will safely fire from your smaller, self-defense size pistol and provide you with adequate terminal performance. As with any ammunition, be sure to test fire a couple of boxes of the exact type of ammunition that you are going to carry for self-defense. 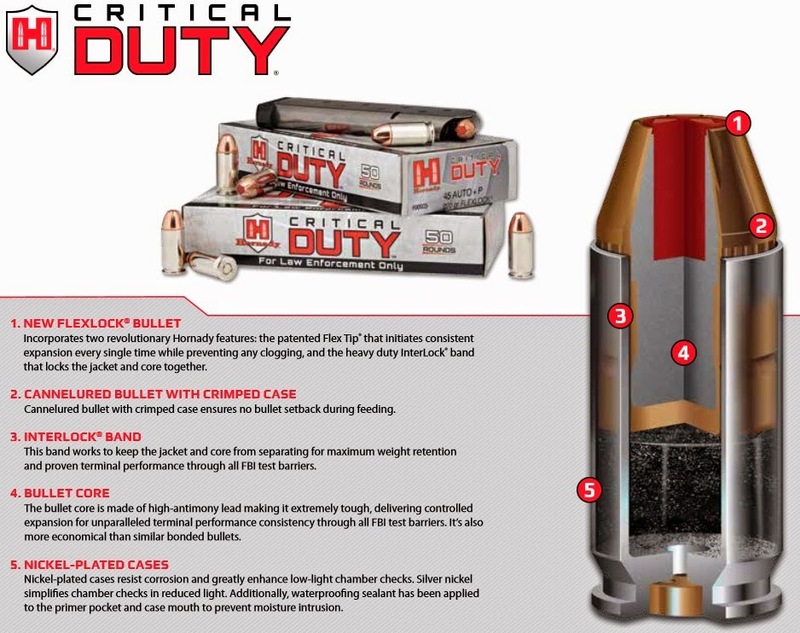 The Critical Duty line is tier one ammunition and meets all of the FBI’s duty ammunition requirements. It is not yet used by any law enforcement agencies and so I have it listed in the “Tier One Self Defense” category. As soon as law enforcement agency adopts it then I will move it into the “Tier One Self Defense Ammo” category. 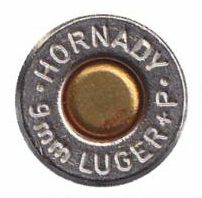 Uses Hornady’s FlexTip (FTX) bullet which is essentially an XTP with a polymer ball inserted inside the hollow-point cavity. It circumvents the problem of hollow points clogging, because the bullet already had an incompressible material inside the nose cavity. 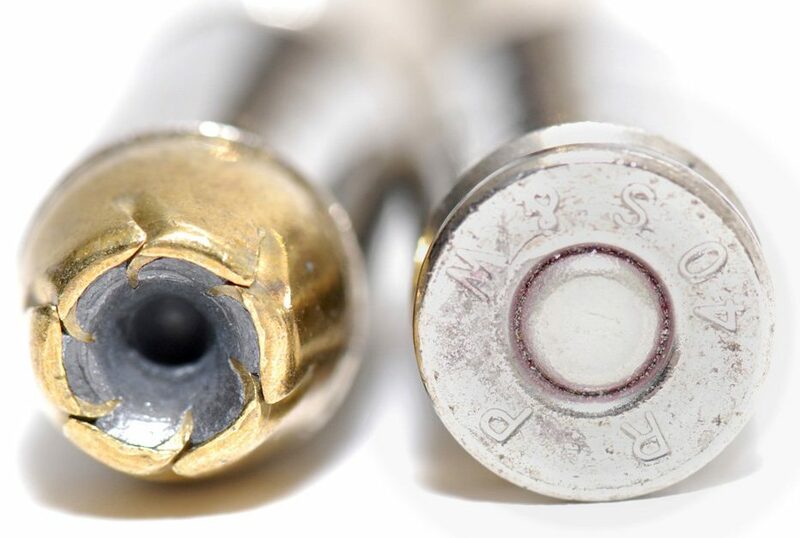 When the bullet impacts something, force on the bullet’s nose presses the polymer ball out against the sides of the cavity and causes the bullet to expand. This bullet does not depend on velocity for expansion. Hornady Critical Defense is designed and optimized for use in self-defense handguns with shorter barrels. It does not meet the FBI’s barrier penetration requirement. 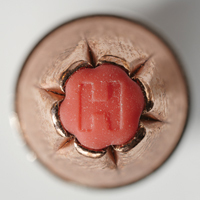 Critical Duty can be distinguished from Critical Defense by the H embossed on the tip (as seen pictured right). Critical Defense does not have the H.
For smaller, compact “self-defense” size pistols and those whose operating manual recommend against using +P ammunition, such as the S&W Shield, Glock 43, and Ruger LC9, you will want to use a normal pressure load. There are several types of ammunition that are designed and manufactured specifically for these smaller handguns. These rounds are optimized for less felt recoil, more reliable cycling and better control with subcompact pistols, but do not meet the FBI’s barrier penetration requirements to qualify as “duty” ammunition. For smaller, compact pistols that are +P rated, such as the Glock 26 or Smith & Wesson M&P Compact, there are several types of ammunition that are +P rated, but are specifically designed for pistols with short barrels. For larger pistols that are not +P rated, such as the Ruger P-89 or Taurus PT-92/99, most 124 grain JHP ammunition will be acceptable, however there are several that really shine with standard velocities fired from duty-size pistol barrels. With only a few exception, 147-grains is the heaviest projectile that is fired from 9mm weapons. Use 147-grain ammunition when using suppressed 9mm firearms as the heavier bullet is subsonic and will not cause a supersonic crack as it flies through the air. Using lighter, faster ammunition will still be quite loud. **Do not use 147-grain ammo for self-defense unless you are shooting a suppressed pistol, or it is all that you can find. It will function in your firearm, but under most circumstances the terminal performance from 147-grain ammunition fired from is substandard. The bullet is subsonic (no supersonic crack) and is intended for use with suppressors mounted to sub machineguns which have longer barrels than handguns. Fired from the short barrel of a handgun, the heavier bullet’s reduced velocity will lessen its hydrodynamic effect inside the target, thus limiting the ability of the bullet to fully mushroom and maximize its destructive potential. Also, because it can’t fully expand and transfer its energy into the target, the bullet has a higher chance of passing completely through the target and hitting an unintended target. This loss of terminal performance is the compromise for quieter shooting. 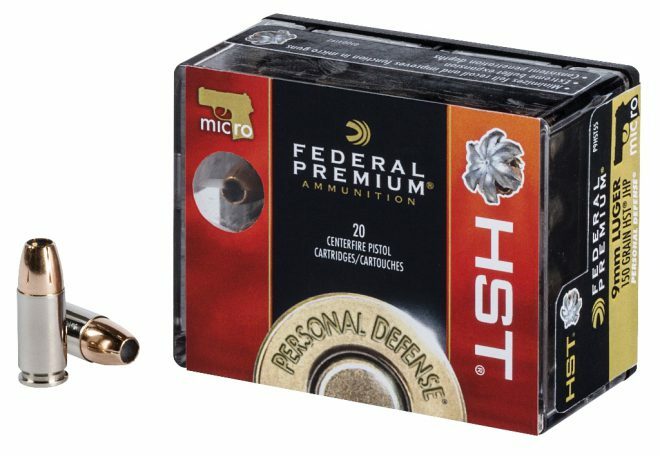 Discussed above, 147-grain +P JHP from Federal’s “Tactical HST” and the 150-grain JHP from Federal’s “Personal Defense HST” lines of ammunition seems to be the exception. Even with a velocity slower than most 115 to 135-grain +P offerings from other manufactures, its heavier bullet shows exceptional terminal performance. This should be your go-to ammunition when using a suppressor on your 9mm firearms. Small, sub-compact pistols chambered for .45 ACP, such as Springfield Armory’s XD-S with a 3.3″ barrel, can be painful to shoot. Their small grip and light weight frame exacerbate recoil, especially with heavy 230 grain bullets. Try lighter 185-grain bullets for the compact and sub-compact pistols. Not only will you experience less recoil with the lighter 185 grain bullets, but because of the increased velocity of the bullet, energy levels might compare or exceed those of the heavier 230 grain bullets. 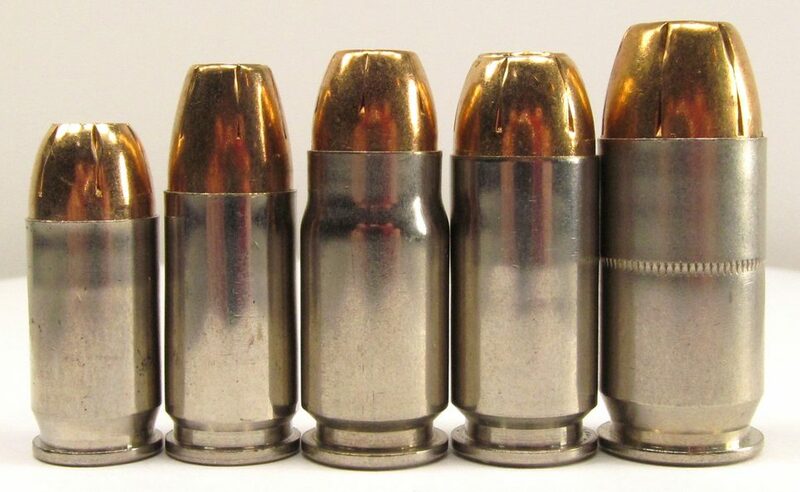 The best self-defense load in .357 Magnum is the 125-grain semi-jacketed hollow-point (SJHP). This round is extremely loud and punishing to shoot and is not recommended to be used as a self-defense load if shooting may occur indoors as permanent hearing damage may occur. The heavier and slower .357 Magnum 158-grain semi-jacketed hollow-point is also a good man-stopper, but is also loud and punishing to shoot. If you own a .357 Magnum and use it as a self-defense tool for indoors, load it with the less punishing .38 special 158-grain +P semi wad cutter hollow point. Smith & Wesson K-Frame and similar size .38 special caliber revolvers with four-inch barrels and fixed sites shoot closest to the point of aim using 158 grain ammunition. Lighter ammunition will shoot high. With a four-inch barrel .38 special revolver, the statistically best ammunition to use is the classic “FBI Load” 158 grain +P semi wad cutter hollow point (+P SWCHP). It has proven to be a potent man-stopper in many police shoot-outs. It matters what kind of ammo you shoot out of these guns. Generally speaking, full-size .38 Special revolvers with 4″ barrels and fixed sights are calibrated for 158-grain ammunition, however with snubnose revolvers you may find that heavier (158-grain) ammunition shoots high, and lighter (110-grain) ammunition shoots low. Also, heavier bullets may not always reach enough velocity to fully mushroom in the target when fired from a short barrel revolver. Most snubnose .38 Special revolvers shoot best with 110 to 135 grain ammunition, both in terms of accuracy, and with terminal performance. Here is your spoiler: If the revolver is rated for it, YES. If you ever have to use a .22LR pistol in a self-defense situation, statistically you will get better terminal performance from round-nose bullets. The round-nose bullets will penetrate farther and have a better chance of damaging internal organs. 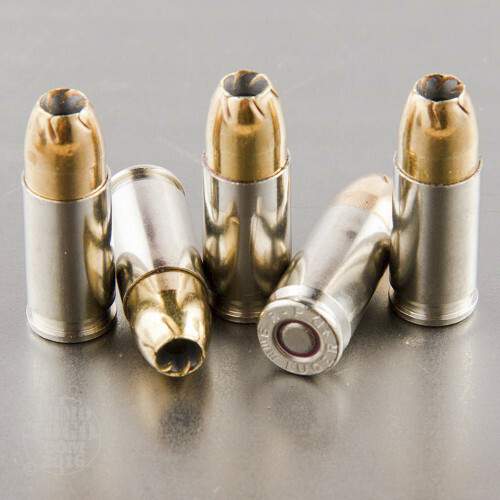 Fired from a handgun, hollow-point bullets may either mushroom and lose their energy before reaching vital organs, or may hit bone, deform, and dissipate all their energy prior to hitting anything important. Use high-velocity hollow-points with your .22LR rifle. You will get better performance from hollow-points with the higher velocities that you can expect with a longer barrel on the rifle.